The fun thing about having friends with kids is getting make cute and creative cakes and cupcakes for their birthdays, like these Sesame Street cupcakes. 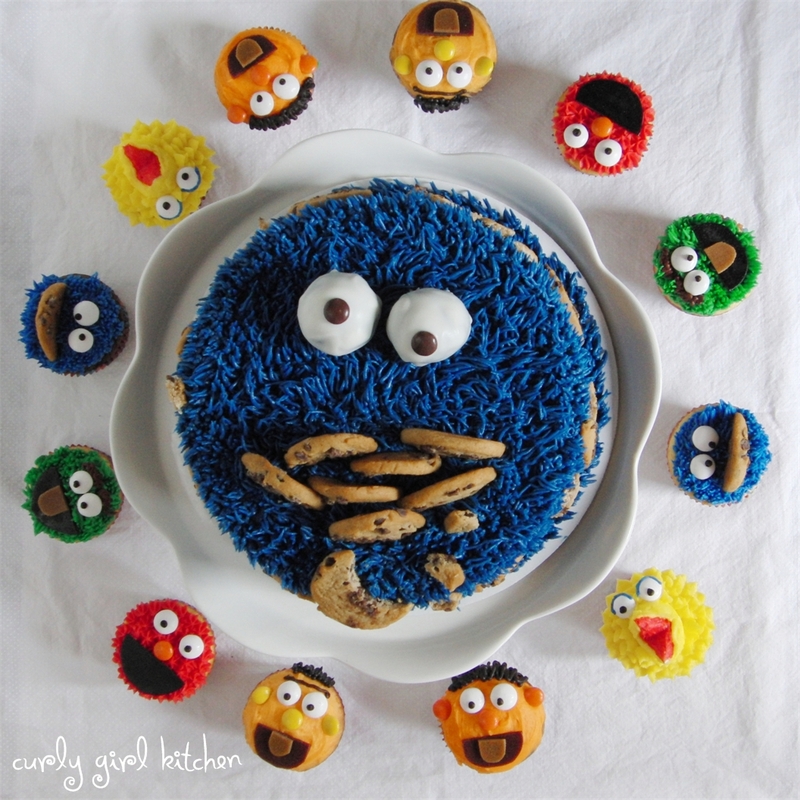 For a friend's daughter's 2nd birthday, I was asked to create a bunch of Sesame Street cupcakes for the "kid party", and then a Cookie Monster cake for the "family party" the next day. I wanted to make these with easy to obtain, yummy ingredients, so there's no fondant or gum paste involved, just candy, fruit leather, marshmallows, cookies, cake and frosting - all things that kids like to eat - and a few hours of your time to pull it all together. 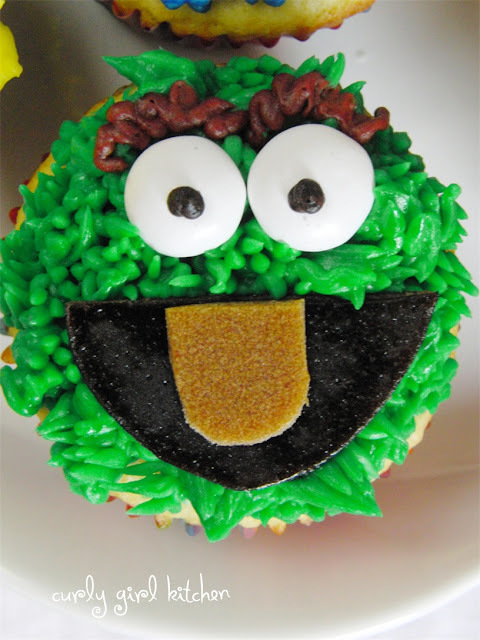 In this post you'll find a complete list of all the supplies you'll need, and then a step-by-step tutorial to create each of the following cupcake characters: Bert, Ernie, Elmo, Cookie Monster, Big Bird and Oscar the Grouch, as well as a simple Cookie Monster Cake. Wilton Tips #s: 1 & 2 (small round), 17 (small open star), 233 (grass), 352 (“v”). Since I made 6 characters, I only decorated 4 of each for a total of 24 cupcakes. 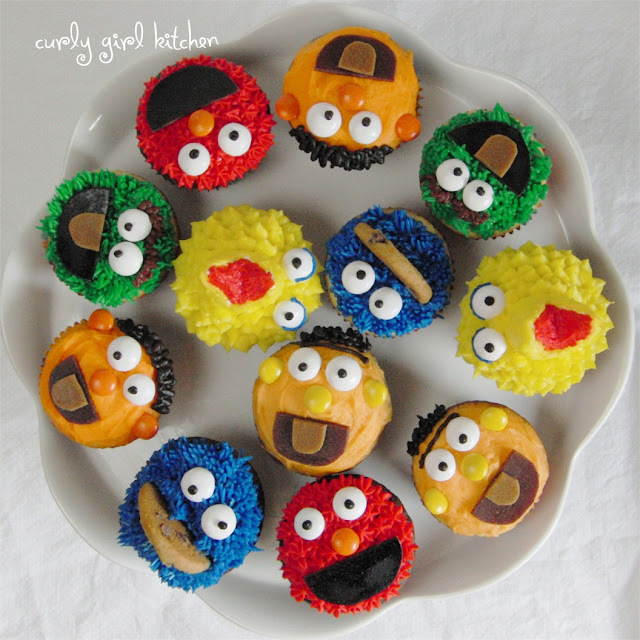 Divide the buttercream evenly into 6 bowls, and then color each the desired shades of red (Elmo), royal blue (Cookie Monster), light orange (Ernie), dark orange (Bert), green (Oscar the Grouch), and yellow (Big Bird). You will need small amounts of brown and black frosting, but you don't need to reserve any frosting for this. Once you've used all you need of each color, simply combine them into one bowl. The combined colors will turn brown. Use what you need for the brown piping, and then color it black for piping the pupils on the eyes. 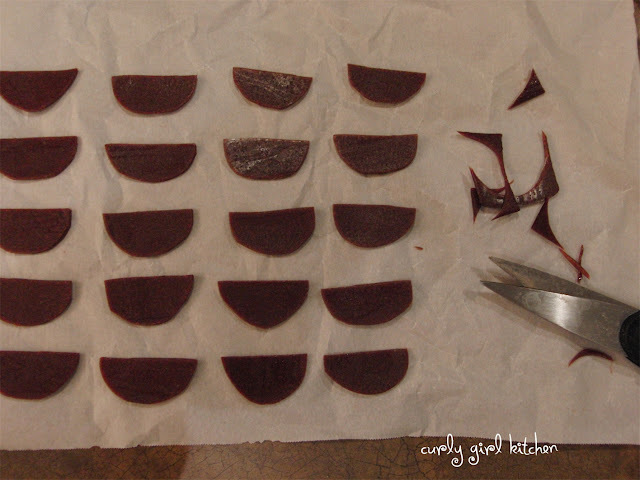 For the fruit leather mouths and tongues, use a pair of scissors to cut the shapes. Cover the cupcakes with frosting using a knife or spatula, light orange for Bert and a slightly darker orange for Ernie. Place the white M&Ms for eyes. 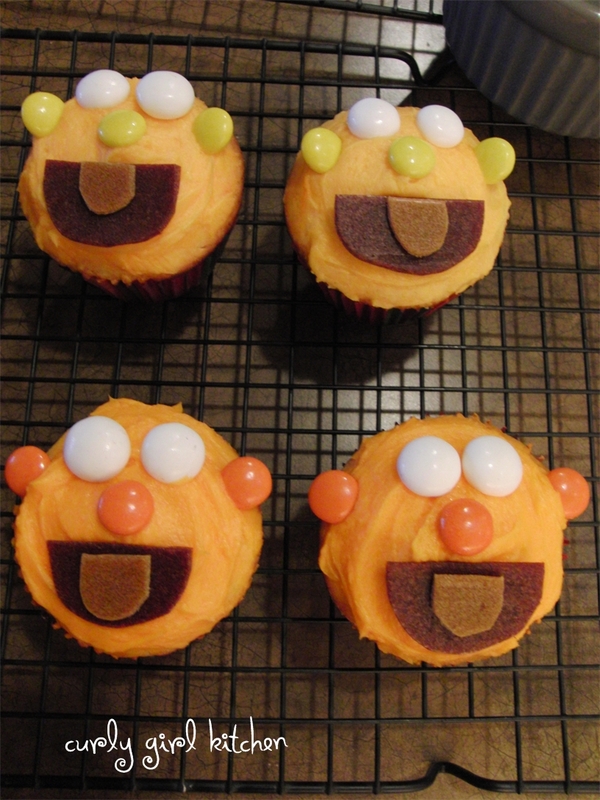 Use the orange M&Ms for the nose and ears for Ernie and the yellow M&Ms for the nose and ears for Bert. Bert has a narrower face, so place his ears closer together to create this illusion. Give each a cherry fruit leather mouth (not painted black) and a strawberry fruit leather tongue. 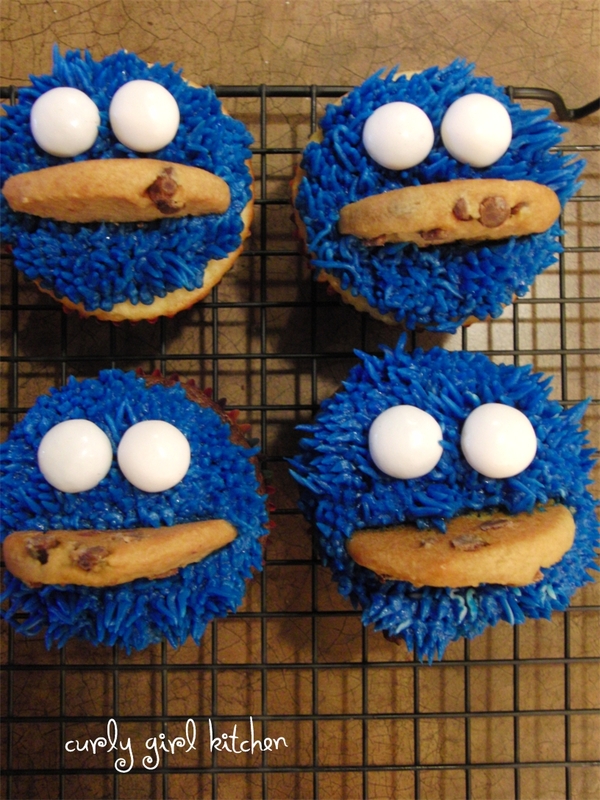 Use a small round tip to pipe the pupils on the eyes with black frosting. 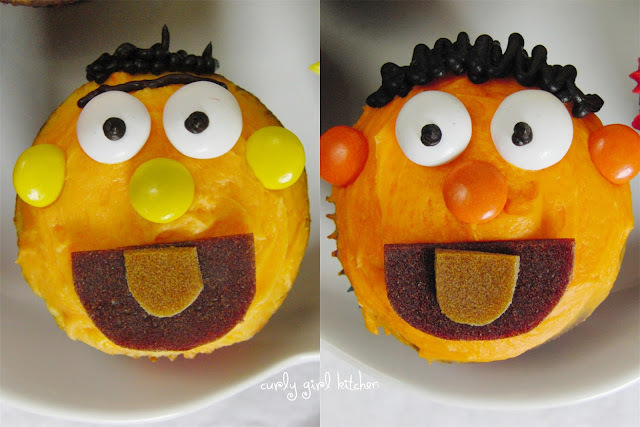 Use a small round tip to pipe Bert's unibrow with black frosting. Use a small round tip to pipe a squiggly row of hair on each with black frosting. Use the scissors to make a vertical snip through the middle of each marshmallow, about 2/3 of the way through. 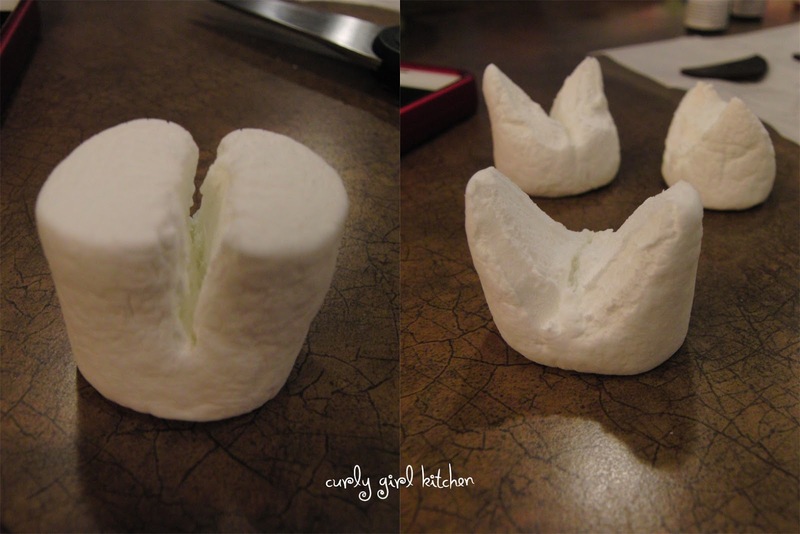 Snip away enough marshmallow to create a shape like a beak. 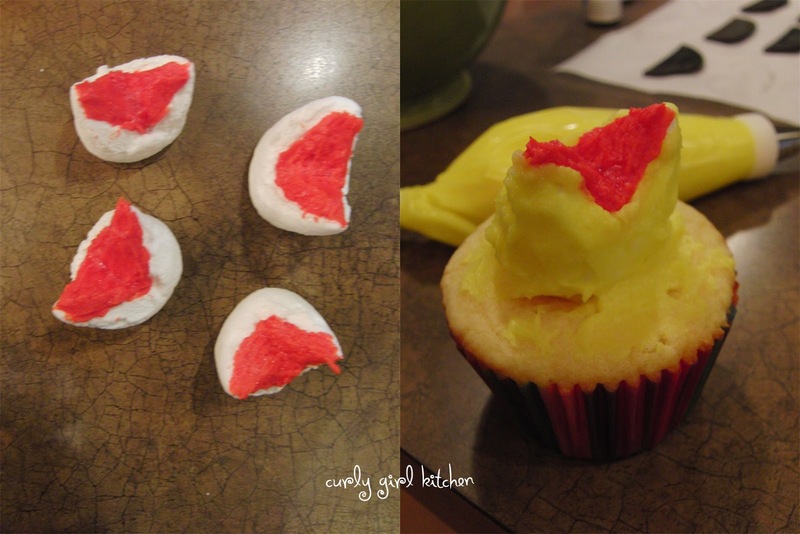 Squeeze a dab of yellow frosting onto each cupcake then place the marshmallow beak on top. Spread red frosting inside the beak, then cover the outside of the beak with yellow frosting. 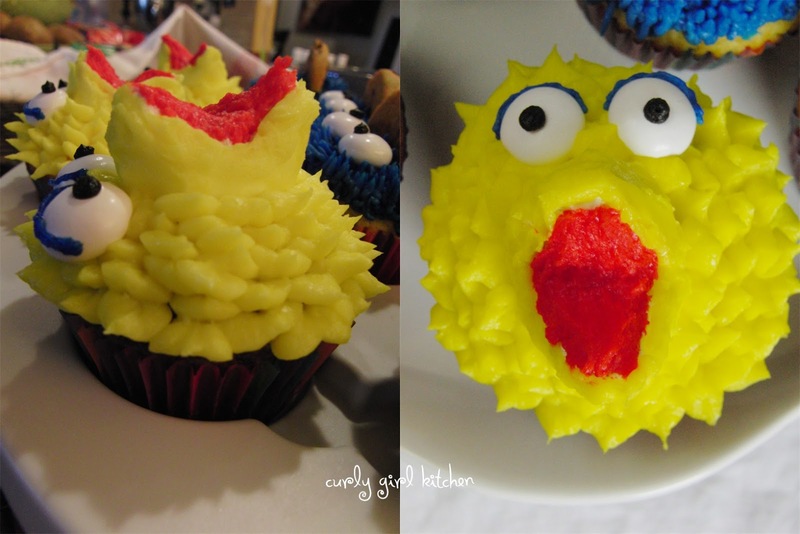 Use the "v" tip to pipe yellow feathers all around the beak and over the cupcake. Place the white M&Ms for the eyes. Use a small round tip to pipe the blue border above the eyes. Use a small round tip to pipe the pupils with black frosting. Use the star tip to pipe red fur all over the cupcakes. Place the orange M&M for the nose. Place the black fruit leather mouth. Using the grass tip, pipe green fur all over the cupcakes. 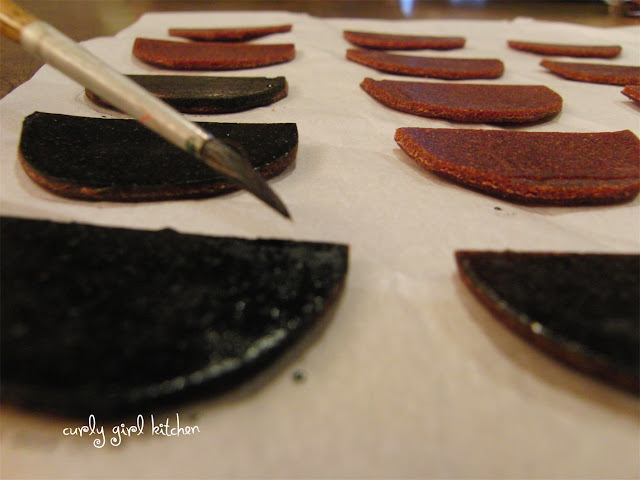 Take one of the black fruit leather mouths, and position a smaller piece of strawberry fruit leather on top for the tongue. Position on the cupcakes. Use a small round tip to pipe squiggly eyebrows in brown frosting. 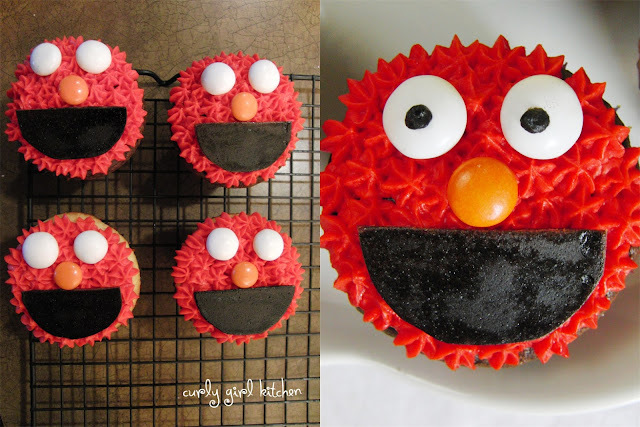 Use a small round tip to pipe the pupils of the eyes with black frosting. 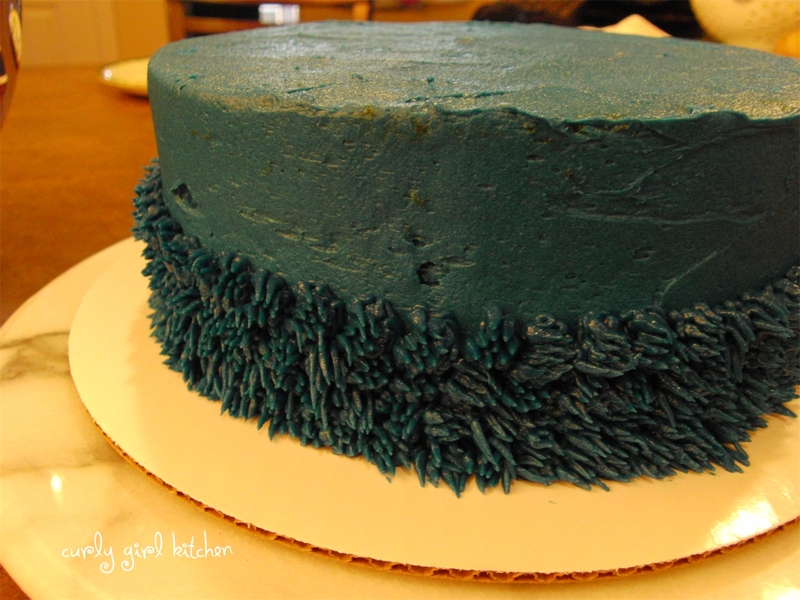 Using the grass tip, pipe blue "fur" all over the cupcakes. Place a half cookie on each for the mouth. Finish the eyes by piping black frosting for the pupils. Bake and cool the cakes, then level the tops of each with a sharp knife. Take the scraps that you leveled off and process in the food processor into fine crumbs. Add a dab of frosting to moisten the cake crumbs and shape into two balls. Set the balls aside in the refrigerator. Color the buttercream with the royal blue food coloring until you reach the desired shade. Frost the cakes with a thin layer of buttercream between and then a thin crumb coat of frosting all over. 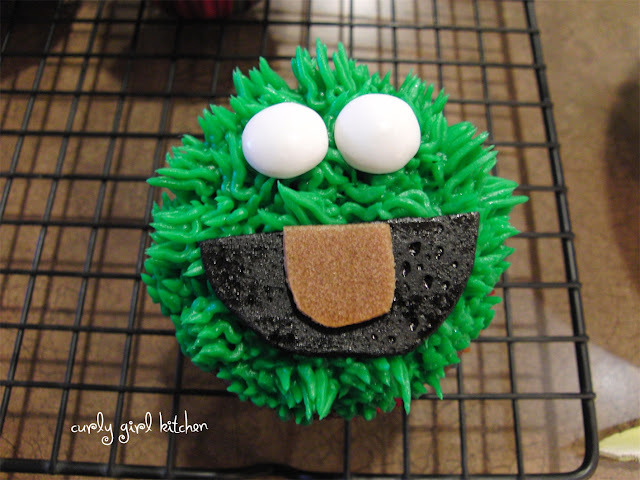 Fill a piping bag fitted with the grass tip with the buttercream. Beginning at the bottom, pipe a row of "fur" all the way around, then continue piping rows of fur until the cake is completely covered. Take the chocolate chip cookies and cut a few in half. Arrange on top of the cake to look like the Cookie Monster's mouth is full of cookies. 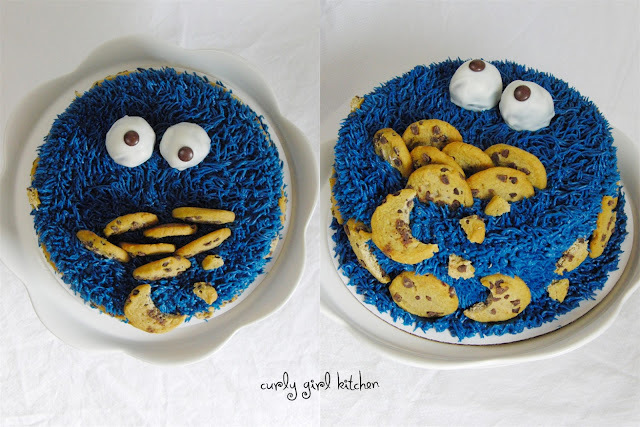 Arrange as many cookies as you'd like around the sides of the cake. I used a small round cookie cutter to make a few look like a bite had been taken out of them. Melt the white chocolate, and dip the chilled cake balls in the chocolate. 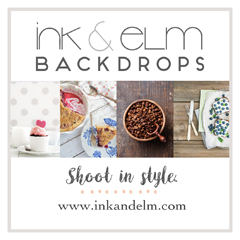 Set on a piece of parchment paper on a plate. 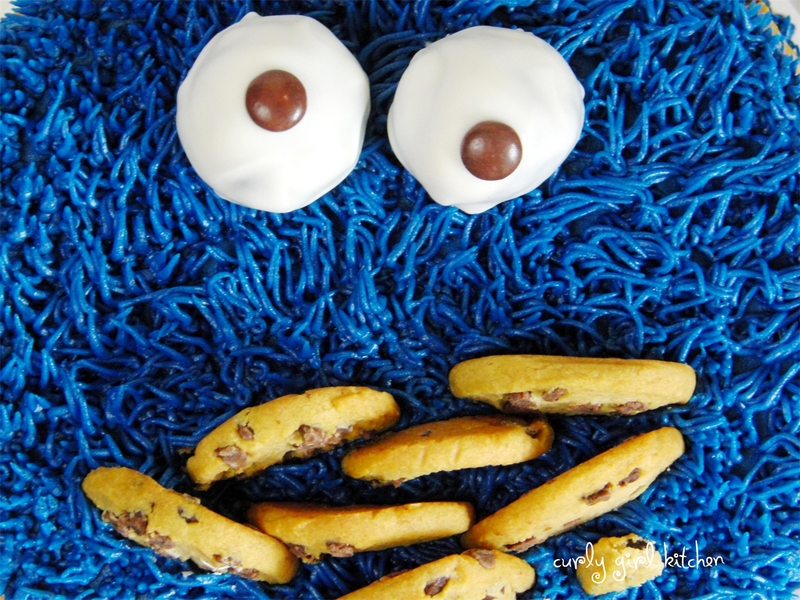 Before the chocolate sets, arrange the brown M&Ms for the pupils on the eyes; they should be slightly lopsided. Chill the eyes in the fridge until the chocolate is firm, then set on the cake.